The 22nd March marked exactly two months until the second annual Run For The 96 5K takes place in Liverpool’s Stanley Park. 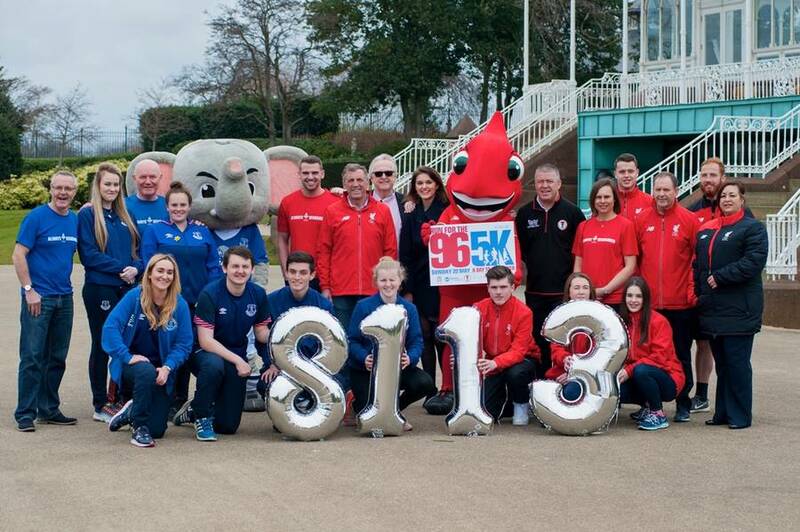 The 2016 fun run was launched today at the Isla Gladstone Conservatory in Stanley Park, with the help of the event’s official charities the Liverpool FC Foundation and Everton in the Community. The overall aim of the Run For The 96 5K is to celebrate the lives of the 96 Liverpool fans who sadly lost their lives in the Hillsborough tragedy on 15 April 1989, and to also remember their families and the survivors through the community legacy event. Liverpool Football Club legend Alan Kennedy; Voice of Anfield stadium announcer George Sephton; and Liverpool actor Kurtis Stacey all attended the launch, and are keen to support the event for the second year. The Liverpool FC Foundation and Everton in the Community are the official club charities of the two Merseyside football giants. They have been named as the official charity partners of Run For The 96 5K for the second consecutive year. Run For The 96 5K starts and finishes in Stanley Park, a fitting location between Liverpool’s Anfield Stadium and Everton’s Goodison Park. The inaugural community legacy event took place last April, with 2,500 walkers, joggers and runners taking part in the 5K fun run. It was supported by Spice Girl and Liverpool Football Club fan Melanie C; Merseyside football legends Alan Kennedy and Graham Stuart; Liverpool actors Les Dennis and Kurtis Stacey; MPs Steve Rotheram; Andy Burnham; Voice of Anfield George Sephton; and sports impressionist Darren Farley. Participants were encouraged to take part while wearing their specially designed commemorative red and blue T-shirts – with fans of both football clubs running side by side for the very first event of its kind. The event also attracted wheelchairs users, families, fancy dress runners, and even some who ran with their dogs – making it a real inclusive event for all. This year’s event will take place on Sunday, 22 May, and the event is expected to grow bigger for 2016. As well as running to remember The 96, participants are invited to fundraise for the Liverpool FC Foundation and Everton in the Community, the charitable arms of the city’s two football clubs to enable them to continue their fantastic work across Merseyside. The charity element is a key part of the event’s commitment to ensuring that local communities benefit from the legacy run. All funds raised or donated by those taking part are split equally between the two charities. Today’s launch also marks the official announcement that £8,113.32 was raised for the Liverpool FC Foundation and Everton in the Community through the 2015 event – therefore each receiving £4,056.66. Football coaches and young people benefitting from charity projects delivered by the Liverpool FC Foundation and Everton in the Community were present at the launch, and were joined by their respective club mascots Mighty Red and Changy The Elephant. “All money raised will support the LFC Foundation’s strategy of supporting young people’s health and life chances through our programmes and partnerships. “We are again honoured to be invited to be involved in the Run For The 96 5K and are delighted to be one of the charity beneficiaries. All the monies raised for Everton in the Community from this fantastic event will go towards helping the underprivileged and vulnerable members of our local communities. Everton in the Community projects the funds are supporting include a twice weekly evening Youth Zone at Everton Free School, where local children are offered a safe haven and the chance to access games and activities; and a new programme called Stand Together which tackles social isolation in over 75s living in the Everton ward, offering four interactive sessions each week at Goodison Park for those currently experiencing limited social contact. Run For The 96 5K has the support of the Hillsborough Family Support Group (HFSG). As a mark of respect before runners set off on their 5K, the crowd joined together for a minute’s applause to remember The 96. Hillsborough Family Support Group Chairman Margaret Aspinall officially started the legacy run. She then congratulated runners as they crossed the finish line, presenting them with their medals. Run For The 96 5K is the brainchild of Liverpool fan Dom Williams, a dad of four originally from Liverpool who now lives in the South West of England. Dom has organised the mammoth three-day Hillsborough-Anfield team running challenge for the past four years. He developed the idea of Run For The 96 5K with race organisers BTR Liverpool to create a new 5K community legacy fun run as a way of engaging the wider community to run to remember The 96. This year, Dom and his team of 15 dedicated runners and support crew will run from Hillsborough-Anfield covering 80 miles in less than 24 hours. They will leave the Hillsborough memorial at Sheffield Wednesday on the morning of Saturday, 21 May, and will run through the night. They will arrive at the Isla Gladstone in Stanley Park the following morning, in time to take part in the 5K. “I first had the idea about Run For The 96 5K four years ago. I wanted to create something positive in memory of The 96 and thought a 5K fun run would be a way of engaging the wider community. Together with BTR, we made it a reality last year and the legacy is now supporting the work of the two official charities. The entry fee for Run For The 96 5K will pay to stage and deliver all aspects of the event. All participants receive a commemorative T-shirt and medal. Full details and online entry can be found at www.btrliverpool.com or call into the BTR office at 82 Market Street, Hoylake.